Shown above: 2 Usso Club Chairs, 1 Usso Loveseat, and 1 Sunn Table. 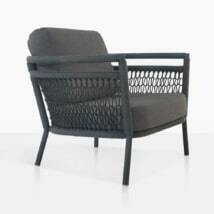 Create a contemporary outdoor relaxing space with the Usso Furniture Collection. It is light, airy, modern, and eye-catching. The Usso family includes a loveseat and club chair. The charcoal grey Sunbrella® cushions are included as shown with this deep seating collection. 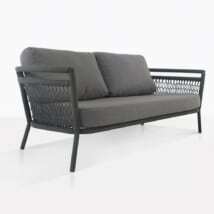 Call or email us today to order your Usso Outdoor Furniture Collection.